Almost half of the Russian public believes the ban on Muslim headdress in schools should be lifted, but an equal share says authorities should not allow kids to demonstrate their religious allegiances in schools. According to the latest research by the state-run VTSIOM polling agency, 47 percent of Russians currently see nothing offensive in the practice of Muslim girls wearing hijabs in schools (compared to 35 percent in 2012). The proportion of those who said any external manifestations of belonging to any religion in schools must be restricted was also 47 percent (down from 53 percent in 2012). Six percent said they could not choose sides in this discussion in 2017, half the number who said so in 2012. The share of those who opposed the hijab ban was predictably higher among Muslims , but also among younger people (18-24 years). The opposite opinion was shared by people over 45 years old and those who described themselves as atheists. The head of VTSIOM’s department for special programs, Elena Mikhailova wrote that the main factor causing the cautious attitude towards different religious and social groups was the fact that vast majority of the population was poorly informed about these groups. About a week ago Russian Education Minister Olga Vasiliyeva voiced support to the ban on hijabs in schools imposed by the Supreme Court ruling in February 2015. “I don’t think that true believers try to emphasize their belonging to certain religions by external attributes,” the minister said. The head of the Chechen Republic Ramzan Kadyrov voiced disagreement with this position by an Instagram post. He called Vasiliyeva’s statement her own stance and added that his own three daughters wear hijabs in class, all get good marks and would never remove the traditional Muslim headwear no matter what. 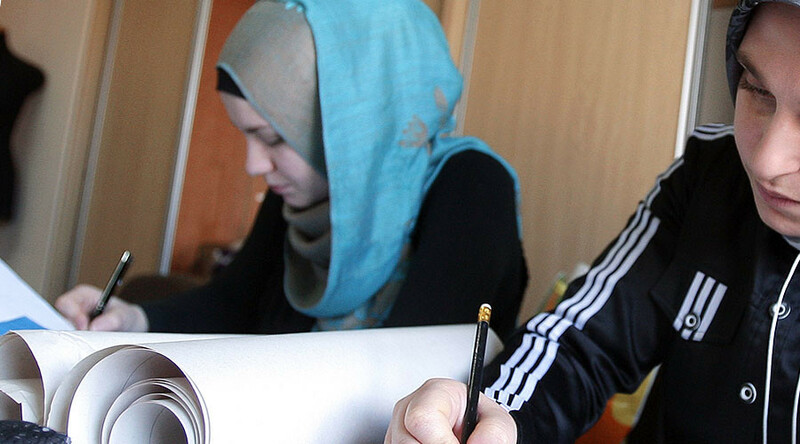 In February 2015, Russia’s Supreme Court ruled to uphold the ban of Muslim headwear in schools, which had been introduced by authorities in the Republic of Mordovia. It rejected a complaint lodged by the Mordovian Muslim community, which claimed that the ban on religious headwear in schools violated the constitutional principle of freedom of conscience. The judge ruled that the ban on wearing headscarves in schools did not prevent Muslims from believing in God and did not infringe anyone’s constitutional rights. President Vladimir Putin expressed his position on the issue of hijabs in 2012, when he opposed them being worn in schools. He said although people’s religious feelings must be respected, Russia is a secular state.